Sure sipping on a glass of bubbly while watching the sunset is the epitome of cruise ship bliss however we think that when you have the luxury of a private balcony, you should make the absolute most of it. To help ensure your next at-sea experience is utterly unique we’ve come up with some quirky new ways to use cruise ship balconies. Soaking up the sun by the pool is a wonderful way to spend an afternoon however after days on end your tan lines could be getting a little on the obvious side. Even things out my hitting up your private balcony and soaking up the sun, sans swim suit! Cruise ships are brimming with incredibly dining experiences however sometimes the time is ripe for a civilised night in. whip out the room service menu, order to your heart’s content, roll out a towel or two and then put together your very own private picnic spread. 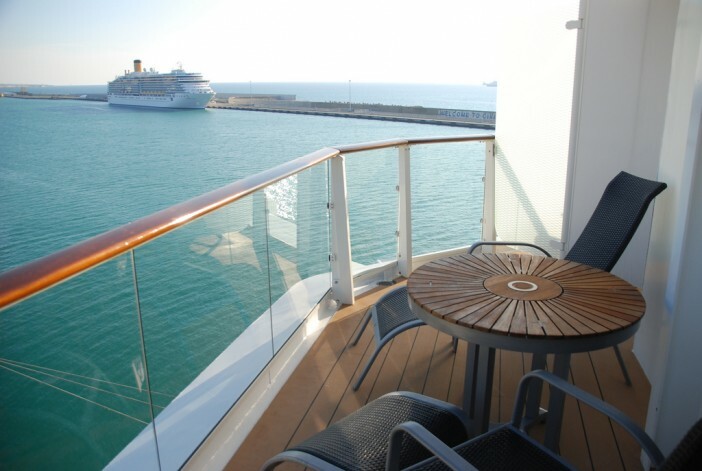 If your cruise cabin balcony is big enough it could be used as a stunning open air yoga studio where you can practice your downward dog while staring out to sea. Of course, we don’t suggest any precarious poses such as headstands! Images sourced via Flickr Creative Commons. Credits: Joe Ross.